Info Shake it! No, not that. The capsule. Alternative Medicine is one of Jimmy T.'s microgames in WarioWare: Twisted! The goal of the game is to shake the capsule by tilting the console repeatedly until its color turns yellow. Once done so, what was put in it will have combined into something. If a monkey and a torch are put into the capsule, they will turn into a man. If a doll and a fish are put into the capsule, they will turn into a mermaid. If three dancers are out into the capsule, they will have made a pose by the time it opens. 1st level difficulty: The capsule starts off orange and it takes a short time to make the capsule yellow. 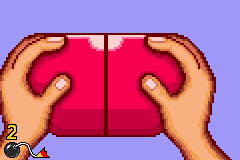 2nd level difficulty: The capsule starts off pink and it takes more time to make the capsule yellow. 3rd level difficulty: The capsule starts off blue and it takes a long time to make the capsule yellow. This page was last edited on January 18, 2019, at 19:56.